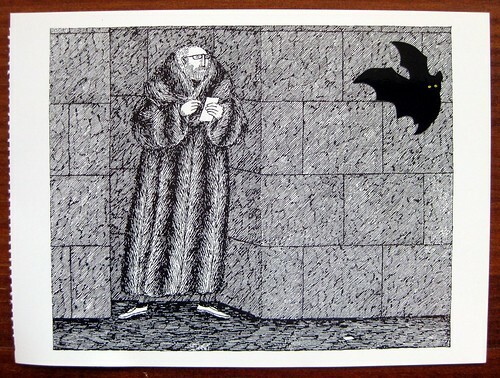 I put some Gorey stamps on the back, plus an advertisement for this here blog, but only got all Gorey-licious after reading in her profile that the recipient was a Gorey fan. 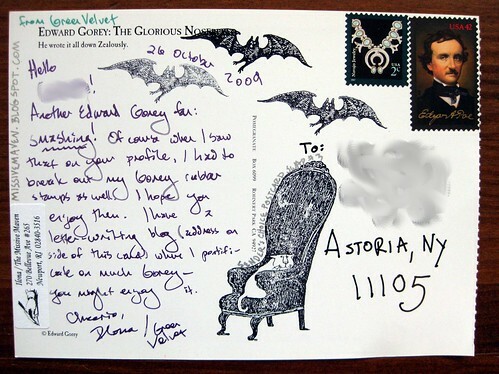 I have since learned not to put quite so much effort into a general open Swap-Bot swap, or should I say I've since learned not to bother with the really general postcards swaps, because most of the postcards I received in these things didn't seem to have much thought put into them. But I had fun with this one. So my current Swap-bot stance is to host my own swaps if I'm really interested in one concept (like the cat postcard swaps - I'll set more up soon! ), or maybe jump into a few interesting and specific ones, but my initial infatuation with Swap-bot has calmed down and I'm devoting most of my postal energy to my regular correspondents again.